For this post, I have put together a collection of the best band saws currently available. The following band saws use the latest innovative components to meet your needs and help to ensure you do your best work. So here is my list of The 10 Best Band Saws. The JET 14 in. Deluxe Band Saw shown with optional fence is designed to meet the needs of today's most demanding woodworkers. There is no need to add a riser block because this saw comes with a massive cast iron frame for increased power that makes it ready to meet your resaw applications..
Built-in 12in. resaw capacity for cutting larger pieces of wood. 2-speed poly-V belt drive system. Newly designed upper and lower cast iron frame for increased strength and rigidity. Easy to view blade tracking window. Blade guide post with rack and pinion adjustment. Upper and lower ball bearing guides reduce friction for longer blade life. Quick-release blade tension for convenience. Enclosed stand with storage shelf and easy access door. Built-in retractable blade guard moves up and down from 0-12 in. resaw. High tension spring design allows for greater blade tensioning. 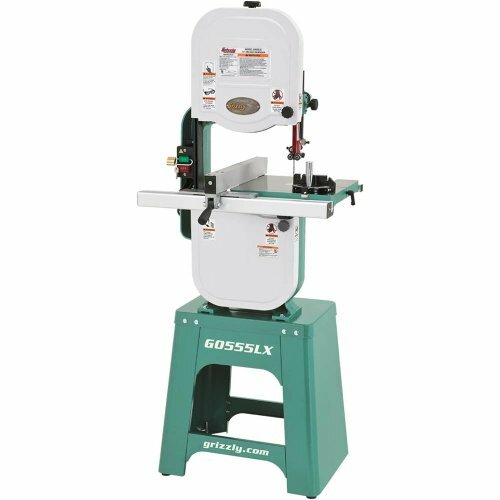 The G0555LX 14" Deluxe Bandsaw features a precision-ground cast-iron table and frame with a sturdy T-shape fence design. Upper and lower ball bearing blade guides and thrust bearings. Includes 3/8" blade, extruded aluminum fence, and miter gauge. Rack-and-pinion guide post adjustment for upper blade guides. Table tilt: 45 deg. right, 10 deg. left. Blade size: 93-1/2" (1/8" to 3/4" wide). 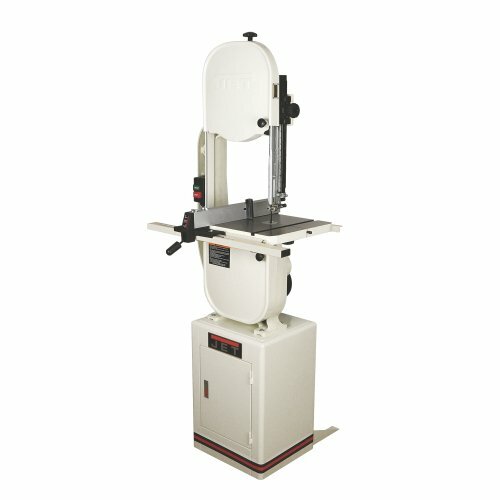 The WEN 10-Inch Two-Speed Band Saw is the perfect companion for any workshop. 3.5-amp motor and a 9-3/4 inch throat. Two-speed operation allows for speeds of either 1520 or 2620 FPM. Uses 72-inch blades anywhere from 1/8 to 1/2 inches in size for a variety of both intricate and powerful cuts. Spacious work table measures in at 14 x 12-1/2 inches in size and can be swiveled up to 45 degrees. 3-in-1 dust port to fit a variety of dust extractor hoses (1-3/4, 2-3/4, 4 inches),. Fence for creating straight cuts, and a miter gauge for angled cuts. Ball-bearings give the blade smooth operation. Easy-to-assemble stand elevates the bandsaw without sacrificing space on the shop's work bench. The DWM120K Deep Cut Band Saw Kit has a powerful 10 Amp motor for operating various jobsite applications and cutting rectangular stock up to 5 inches deep. Variable speed dial allows user to vary speed for specific materials and various applications. 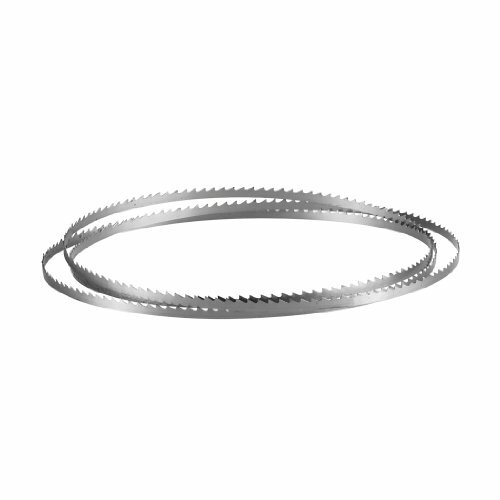 5" deep cut capacity for round or rectangular stock. Multi-position adjustable large front handle offers the user plenty of hand space for a more accurate cut. LED sight light allows the user to see cut line in dark jobsite environment. Variable speed dial allows user to vary speed for specific materials and various applications (100-350 spm). 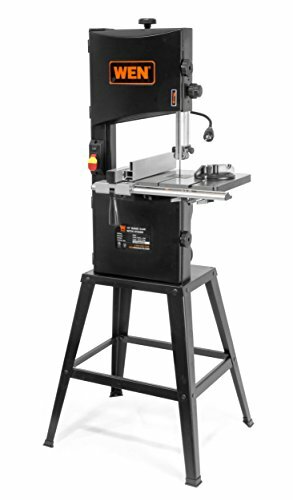 The Shop Fox W1706 14 inch Bandsaw features such as cast iron upper and lower wheels, extruded aluminum fence and rails, quick release blade tension, miter gauge, upper and lower ball bearing blade guides, and an enclosed cabinet stand with storage. Powerful 1-horsepower, single-phase motor that operates at 1,725 revolutions per minute (RPM). Precision ground cast iron miter gauge features an easy-to-read scale that can be adjusted to plus or minus 30-degrees. Features a cast iron table which tilts 45-degrees to the right and 10-degrees to the left for a wide range of cutting options. Deluxe extruded aluminum fence offers solid work support, a hairline scale and is easily adjusted to the desired position where it locks solidly in place. Frame, wheels and table are made of durable cast iron. The 4-inch dust port can be connected to a dust collection system to help keep your workshop clean. 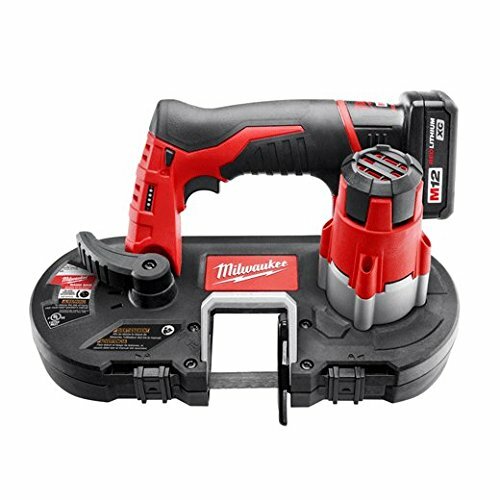 The Milwaukee 2429-21XC M12™ Sub-Compact Band Saw rovides one-handed power and portability to electricians, maintenance professionals, and other users cutting small diameter materials. Weighs only 6.75 lbs and 12” in length, making it ideal for overhead or one-handed cutting applications. Cut through ¾” EMT in only 3 seconds. 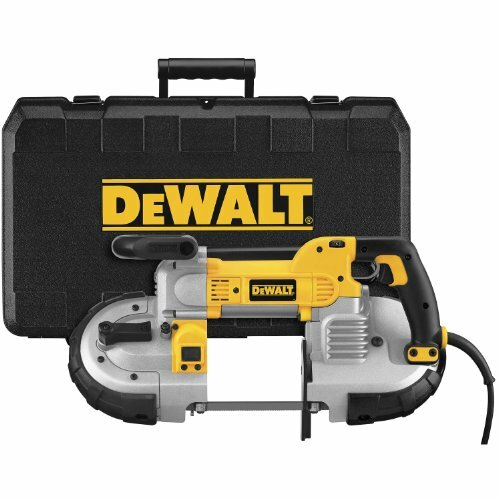 Delivers over 150 cuts per charge with the included M12™ REDLITHIUM™ XC High Capacity battery. 1-5/8” x 1-5/8” cut capacity and low vibration. LED Light highlights the cut line. Blade Tension Adjustment and Adjustable blade tracking. 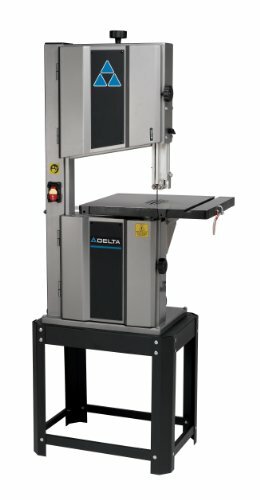 14 inch heavy duty band saw from Delta Machinery features a Dual Voltage (115/230V) TEFC motor for powering through the most rigorous re-sawing applications needed for any woodworking project. The two speed pulley system provides the flexibility needed for cutting a variety of materials and the oversized cast iron table provides great support for larger cutting operations. Includes 4 in. integral dust port, steel stand and a 93 1/2 in. wood-cutting blade. 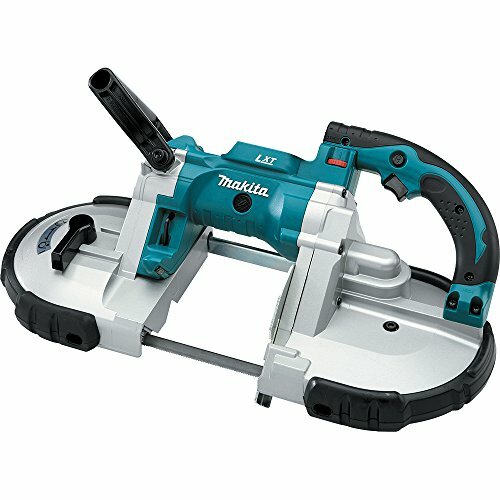 The Makita 18V LXT Lithium-Ion Cordless Portable Band Saw delivers cordless metal cutting power to the jobsite. High torque motor and a compact design with less weight for a range of cutting applications in a variety of metal materials. 6-setting variable speed control dial that delivers a no load speed of 275-530 ft./min. for faster metal cutting. Adjustable foot protects material and provides positive support for more accurate cuts. Weighs just 14.3 lbs. (with battery, sold separately). Compact design at 20-5/8" long and an ergonomic shape that fits like a glove for reduced operator fatigue. Equipped with a built in L.E.D. light that illuminates the work area for more efficient work, as well as rubber bumpers and a removable hook. Part of Makita's expanding 18V Lithium-Ion series. 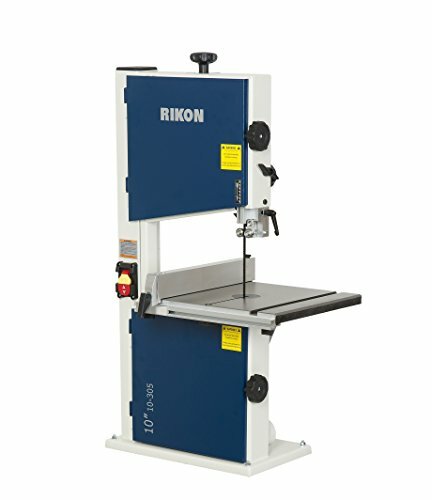 Rikon 10-305 10” Band Saw is great for woodworkers that do not require large cutting capacity and power for their projects, or have limited shop space for a larger saw. Large cast iron table, edge facing thrust bearings. Powerful 1/3 HP, 3.5 amp induction motor. Cutting capacities: Height 4-5/8” and Width 9-5/8”. Option steel stand and a miter gauge are available separately. 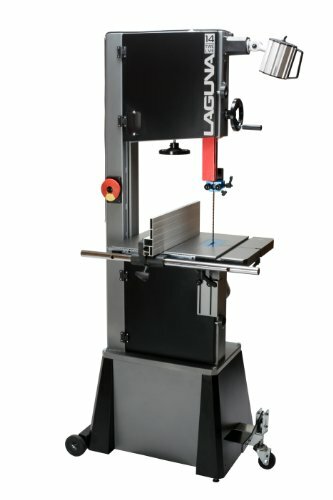 The Laguna Tools MBAND1412-175 Band Saw features include pyramid spine, 3/4 HP TEFC Motor and quick release tension. Micro polished 21" X 16" table mounted to an oversized Trunion paired with Aluminum Hi/Low Fence. Solid Cast Wheels are electronically, dynamically balanced and fitted with polyurethane one-piece tires designed to run cooler and last longer. Worm gear and pinion is ultra-smooth and engineered to have minimum flex even when fully extended. Double windows allows you to check both tension and tracking while the machine is running.. I hope this list of the best band saws was helpful.